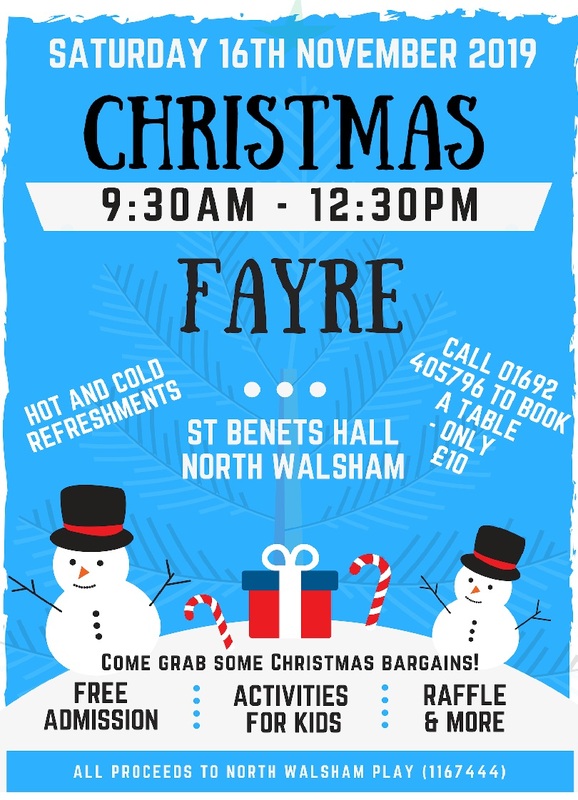 Come and support North Walsham Play at our pre-Christmas Fayre. Saturday 16th November 2019, 9:30am until 12:30pm. Come a grab a few Christmas bargains! All proceeds to North Walsham Play. Stall holders can arrive from 7:45am and need to be setup ready to sell for 9:30am. Clean up and tidy down from 12:30pm. BOOK YOU STALL NOW VIA THIS ONLINE PORTAL. STALLS ARE £10 EACH AND WE WILL PROVIDE YOU WITH A TABLE. Parking available across the road at Vicarage Street Car Park (pay and display).